Thank you everyone for another amazing week of Frugal Friday inspiration!! I look forward to seeing what you all come up with every week...and you never fail to amaze me. The Pennington Point shared her amazing piano makeover. I think this is seriously adorable...and no, I don't mind at all that she painted a piano...I love it! 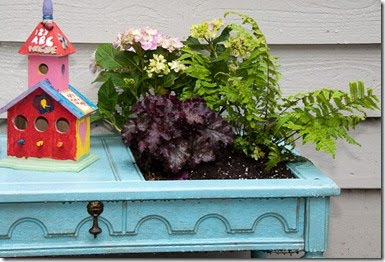 Perfectly Imperfect Life shared an extremely clever coffee table redo. I need one of these for my patio, thank you very much! Little Mac Shack made this amazing upholstered headboard...love the fabric!! 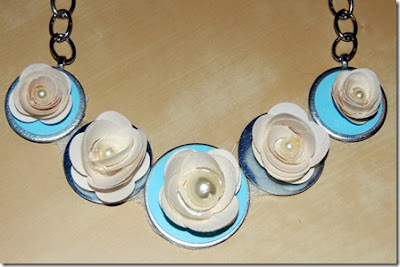 And last but not least, Life in my PJs shared this darling necklace made out of...wait for it....duct tape, washers, and paint chips. No, seriously. Very creative!! If you haven't had a chance to check out last week's Frugal Friday, get your little self over there right now...you won't be disappointed!!! And if you haven't had a chance to enter the Modern Bird Studios giveaway, you still have time, click here! Ooooh I am loving that 'everything' is blue!! :):) That necklace has really got my creative juices flowing. I love these! I just painted my dining room turquoise and bought a turquoise farm table. Its the IT color right now! love your blog!! I LOVE this piano. It's gorgeous. Would love to do this to my mom's old piano (which is in our living room), but I'm afraid I might give her a heart attack! love the piano!! 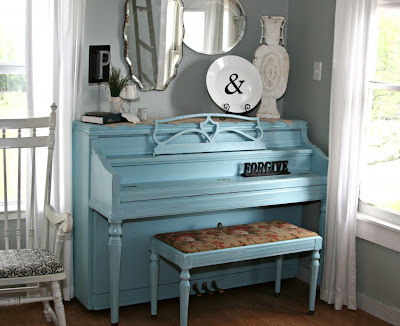 it makes me want to run out and buy a piano just to paint it a fun color! great links!